In gleaming satin, this two-piece short homecoming dress is a fun and flirty style for your semi-formal event. The lovely party dress, in a dark navy black, has a fitted halter top with sparkling jewels at the high neckline. A short circle skirt flares away from the natural waistline and has a tulle lining for added fullness. The vibrant multi-colored floral print wraps around the circle skirt on this short party dress. 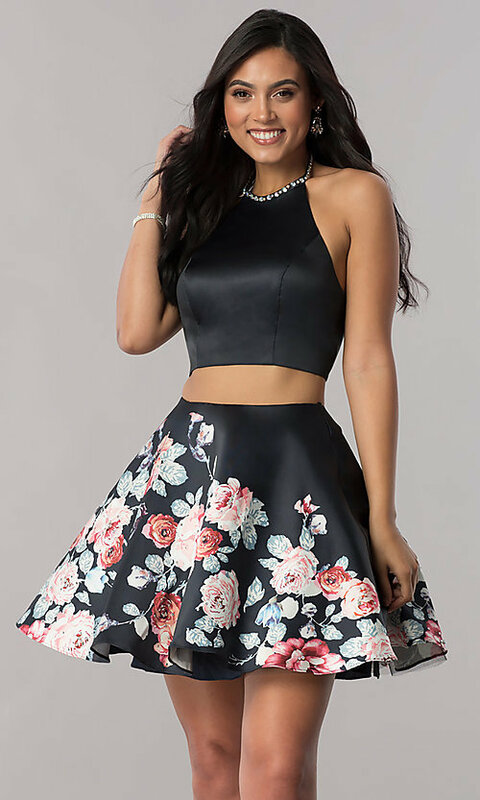 Under $200, this two-piece short homecoming dress is a delightful choice that is ideal for your big night.